KXCI On The Air: Whitehorse in-Studio 2A and at Club Congress Monday night, KXCI Presents! Whitehorse in-Studio 2A and at Club Congress Monday night, KXCI Presents! Tune in for Whitehorse live in-Studio 2A this Monday at 3:30pm on The Home Stretch. KXCI Presents! 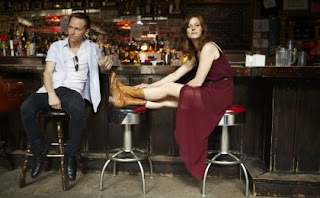 Whitehorse at Club Congress November 26th in a early, all-ages show with Ohioan opening at 7pm. Whitehorse’s mix of indie folk and alt-country is fronted by the Canadian duo of Luke Doucet and Melissa McClelland, both of whom have their own solo careers and side projects (Luke being a sideman for Sarah McLachlan over the years). Their live show is built on mesmerizing guitar work and smoldering vocal chemistry.